“In a study that they said provides no support for the popular notion that hookahs are safer than cigarettes, they reported that hookah tobacco and smoke contain lower levels of four toxic metals than cigarette tobacco and smoke. It was part of the 246th National Meeting & Exposition of the American Chemical Society (ACS), the world’s largest scientific society, being held here this week”. 1-First main heavy lie about heavy metals (psychological manipulation). Please note how a “negative result” (here low levels of highly toxic [carcinogenic] heavy metals such as Arsenic, Chromium, Lead, Cadmium found in the smoking mixtures (moassel/tobamel) used in the Middle East Peace Pipe [Hookah, Shisha, Narghile]), is “presented” along the lines of the global psychological pseudo-science based war against the latter. In other words, their importance is just downplayed so that even for the (wo)man in the street, such a statement will sound quite contradictory…. 2-Second main heavy lie about heavy metals (censorship and bibliographic bias). As if it were a “scoop”, the ACS press release refers to a so-called study by Joseph Caruso and Ryan Saadawi (University of Cincinnati, USA) who would have “unfortunately” found low levels of heavy metals. As usual, there has been no scientist or investigative journalist to note that this only confirms all previous independent (from both the pharmaceutical and tobacco industries) research in this field. So, it is our duty to unveil the truth here. In a 50 page peer-reviewed article published in the International Journal of Environmental Research and Public Health)(and in spite of hard censorship on behalf of antismoking totalitarian lobbies), we did comment studies on heavy metals in shisha (smoking mixture and smoke) going back to year 1991 and carried out by chemists at the Royal University of Arabia. We also refer to a scientific investigation on hookah smoke chemicals, including heavy metals, carried out in the Russian Federation. We could also cite another European investigation. And if it were not enough, we have personally conducted in 2010 a study on heavy metals in shisha moassel in which we did cover uranium and the full spectrum of metallic elements, instead of focussing only on two pairs of heavy metals. The results were announced at an international conference in Japan . All these studies, including the new one sponsored by the ACS, just shatter the widely advertised pseudo-scientific studies led at the US-American University of Beirut (by Alan Shihadeh et al) with North-American funding which led, over the past decade (and never before), to the widespread popular belief that hookahs are more dangerous than cigarettes. The reverse is just true. In sum and after the recent case of plagiarism (by Olivia Maynard et al) of our work in the United Kingdom (“Addiction” journal)[6-7], this “scoop” (as many similar actions elsewhere) just aims at preparing future pseudo-science based “public health” “recommendations” by the US Food and Drug Administration with a view at countering the progress of the Middle East Peace Pipe (Hookah, Shisha, Narghile) on its territory. American Chemical Society. 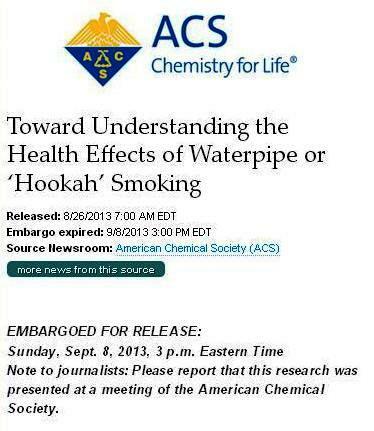 Toward Understanding the Health Effects of Waterpipe or ‘Hookah’ Smoking. “Science”-by-press-release published by Newswise, 8 Sep. 2013. Khlifi R. Response to comment of Dr Kamal Chaouachi on “Shisha Smoking, Nickel and Chromium Levels in Tunisia”. Online 23 Qug 2013. Russian Hookah-Leaks 250 km East of Lougansk (Ukraine)… – The Middle East Peace Pipe (Scientific & Ethical Issues) linked to this post.